You’ve spent hours searching the net and visiting what seems like a hundred garden centre display sites and, attracted by the fact they install all of their timber garden buildings free of charge*, you have decided to order a wooden garden shed from 1st Choice Leisure Buildings in Woking. So, what happens next? Firstly, upon receipt of your deposit, you will receive an email confirmation of your order detailing the size of your chosen timber shed, workshop or summerhouse. Once you confirm back to our Surrey office that everything is correct, the order will go across to the relevant factory where your timber building will be individually designed and hand-assembled by craftsmen using the finest quality materials. On the agreed delivery date the building will be delivered directly to your house on a small delivery vehicle and installed for you* by the factory-trained install team. At that point, your lengthy warranty period will commence. “But, surely it can’t be that simple?” we hear you ask. Well, it is: almost! 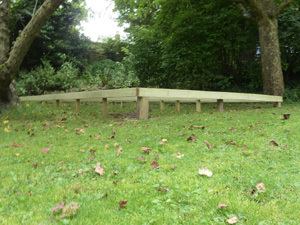 Whilst we will erect your building for you without charge* we do require the provision of a suitable base for the building to sit upon – something that has, in the past, been a bit of a show-stopper from time to time. Whilst some of our customers like to get their hands dirty and tackle the project may have been put off by the thought of the time-consuming, costly and potentially back-breaking task of preparing the site. Ever since we started trading in 1979 it has pained us that this is the one area where we have had to say ‘sorry, that’s something we don’t do.’ That feeling is alien to us. Our goals at 1st Choice Leisure Buildings have always been to make your life as simple as possible and to then go home each evening happy in the knowledge that each and every customer who has taken delivery of one of our buildings that day is delighted with the quality building and the high standard of service that they have received. We are serious about those goals and will only work with a select number of companies who share our beliefs. Over the years we have been approached by numerous companies who claim that they can provide us with a reliable and cost-effective base laying service but we have always remained sceptical and reluctant to embrace their services. However, over the past nine months, we have been putting an increasing number of our customers in touch with Viking Construction Services in Woking who have offered them a number of services such base construction and even removal and disposal of their old sheds. Feedback from these customers has been exemplary and so we have decided to officially endorse their services. Not before time, we are delighted to be able to offer their full range of services to our customers. So, what exactly are we offering? In the old days it wasn’t uncommon to hear of people taking a sledgehammer to their old shed, dragging it into the middle of their garden and setting fire to it! That attitude went out with the ark, of course, so you will be pleased that we can now arrange for your building to be dismantled and disposed of. If necessary we can also dismantle your old brick-built garage, your metal shed or your greenhouse. Viking Construction Services are licensed by the Environment Agency as an authorised waste carrier and will provide certification upon request. Why is this important? Well because, if you employ a less scrupulous company and your shed ends up dumped in a field, YOU are ultimately responsible. The authorities do not mess about when they come knocking on your door – and rightly so! The addition of our base construction service is the real big news and it is something that should be considered by everyone. 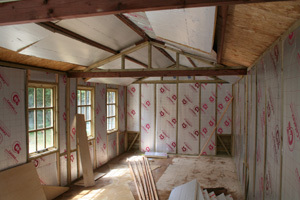 It is vital to the longevity of your new shed, summerhouse or home office that it sits on a good solid foundation. Without this the life of the building will be severely reduced and you may find the building listing to one side, the floor bouncy and rotting, doors and windows sticking and the roof leaking. There are various methods of creating a suitable base ranging from concrete, through paving slabs to the latest innovation: the ProBase recycled interlocking tile system. For a super solid job though we recommend the timber subframe method. First, a hefty outer timber frame is constructed to the exact size of your new garden building using maintenance-free Tanalised timber. 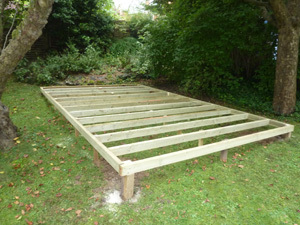 This frame is then spanned with a generous number of cross joists and then squared and levelled to suit your ground. It is completely self-supporting and the vertical supports which are driven way down into the ground ensure that this system works perfectly even on a slope. 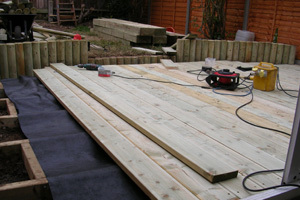 Viking can also carry out most other pre-install services from pruning your trees to building a run of fencing or constructing an area of timber decking on which you can sit and enjoy the summer sun. Once your building has been installed they can return to carry out any other services required such as applying an extra coat of timber preservative or fitting guttering to catch that precious rainwater. Inside your building, it is possible to line and insulate it and add shelves or a workbench to create a fantastic workshop or, if you are looking to add extra space to your home, they can fit it out as a comfortable and stylish home office or games room. They are even able to source and install furniture to your requirements leaving your building ready for you to move in. When looking for a new garden or leisure building we are now truly your one-stop shop. For further information or for your no-obligation estimate please contact Craig in our Woking office on 01483 725350 or 07792 060216. (*) Our free erection offer applies to the Diamond, Platinum ranges of timber garden buildings only and is subject to the delivery restrictions imposed by the manufacturer of each of these ranges. Delivery charges may be applicable. Please see the relevant product information pages for full details.